In 2008, Mark Rylance won a Tony for his Broadway debut in the play Boeing-Boeing and gave an inexplicable speech about wearing uniforms. He won again in 2011 for Jerusalem, and this time he talked about walking through walls. These weren't just weird ramblings as they appeared; he was reciting poems by Minnesota poet Louis Jenkins. The two men didn't know each other at the time of the first speech, but by the second one they had begun collaborating on writing a play that consists of several of Louis' poems strung together (including both of Mark's speeches). 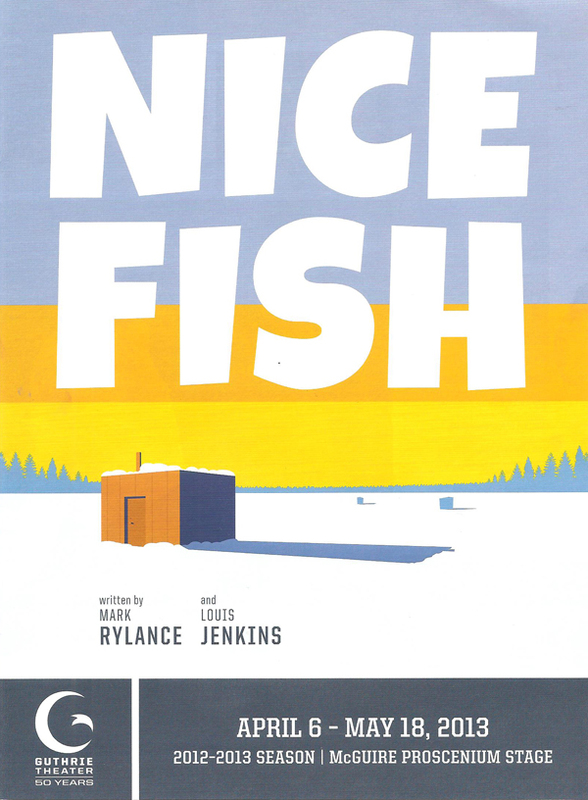 The result is an absurd, hilarious, strangely profound, and yes, somewhat inexplicable play called Nice Fish (sort of like Waiting for Godot on ice), now playing at the Guthrie's Proscenium Theater. The stage of the Proscenium Theater has been quite effectively transformed into a frozen lake by set designer Todd Rosenthal. A bare glassy surface with wisps of snow strewn about and a backdrop of a distant shore are all that adorn the stage when the play begins. It perfectly captures the stark beauty of winter. Later, complex fishing equipment is brought out, including a tent, a fish house with sauna, a vintage snowmobile, and neon palm trees - just your typical Minnesota winter scene. The visual delights continue with twinkling stars, objects that fly or float across the ice, and a delightful battle with the wind. 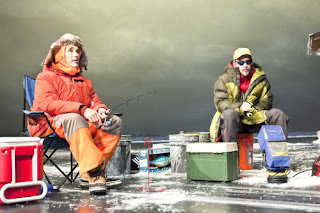 The play begins with a series of short vignettes, some only seconds long, punctuated by lights out, that show us two friends setting up for a long day of ice fishing. Eventually they start speaking, to each other or thoughtfully to the air, little observations about life. Often the biggest laugh comes when the lights go out and the audience realizes that's the end of the scene. The scenes slowly build until we learn a bit more about these two fishermen - Erik (Jim Lichtsheidl) is an experienced fisherman, married with a couple of kids at home, while Ron (Mark Rylance, who also directs with his wife Clair van Kampen) is new to this fishing business and is on a bit of a quest to find himself. 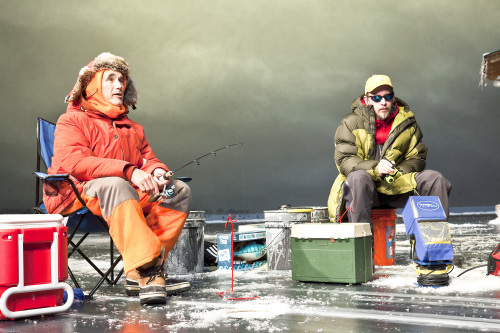 Jim and Mark are a great pair, an odd couple, and my favorite scenes of the play are those with just the two of them on the ice, talking about nothing and everything (I thought the same thing when I saw Waiting for Godot at the Jungle last year, which also featured Jim). Mark's Ron says everything in a sort of dazed way, as if he's as surprised by what's coming out of his mouth as anyone. He's easy-going and happy to experience all that life has to offer. Jim's Erik speaks with precision and certainty; he just wants to fish and is disturbed when things don't go according to plan. And they don't. Erik and Ron have a few visitors out there on the ice. First, a DNR officer (a hilariously stern Bob Davis) wants to make sure they have their licenses in order, which of course they don't. Later, they run into a strange young woman named Flo (a charmingly spacey Emily Swallow), her brute of a boyfriend (a long-haired and imposing Chris Carlson), and his brother (Tyson Forbes, tall and silent). These three characters are odd, not of this cold and stoic state of Minnesota. They represent gods of Nordic mythology, and strange and wonderful things happen. There's music, dancing, and hockey. As the play ends, Ron and Erik transform into something else, and something else again. One of the characters says, "Old people leave this life like a movie - I didn't get it!" That's a little how I felt leaving the theater - I didn't quite get all of it, but it was a marvelous experience. 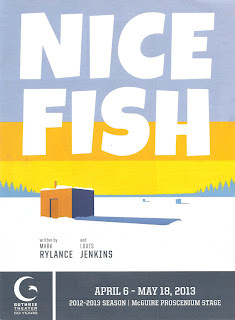 Nice Fish continues at the Guthrie through May 18 (which is probably about the time the ice will be gone from Minnesota's 10,000 or so lakes). Go see it, and bring your favorite fisherperson.